Hi again! Summer time and all but zero responsibility makes me a very productive blogger! I only wish this could be my life all year round! Anyways, today I wanted to share with you my first impressions of the new product from Ciate called LashLights. Ciate is most well-known for its innovative nail products (enter:: Caviar manicure, Shell manicure ect.). This is actually the company's first makeup release to my knowledge, which is exciting, because overall the product is awesome! 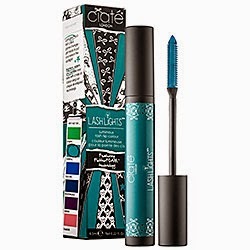 It's basically a highly pigmented colored mascara that you paint onto the tips of your lashes (ideally) or the whole lash. I promise, this stuff shows up! Retails for $17 and there are currently 6 color options (green, navy blue, aqua, pink, purple, electric blue). I have the light blue (called Surreal). If you like the way it looks in the vid below, act quickly! The Ciate website claims that these are limited in stock!